A fun way to manage classroom behavior. Download includes monkey and banana, two bulletin board posters, a classroom key and a parent communication sheet. Each student gets a monkey and starts the day with 5 bananas. The goal is to have 5 at the end of the day. 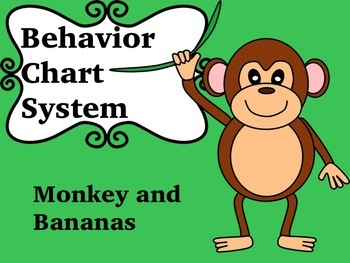 Students can lose and earn bananas depending on behavior. The communication sheet is sent home everyday letting the parents know what kind of stripe day it was for their child and a chance for the parents to initial next to each day. Bulletin Board poster sayings: Make it a 5 Bananas day! & How many bananas did you earn? Works best if laminated and use velcro to attach and detach bananas.